Delight your loved ones with our freshly baked cookie blooms. Neatly arranged and delivered to their doorstep. 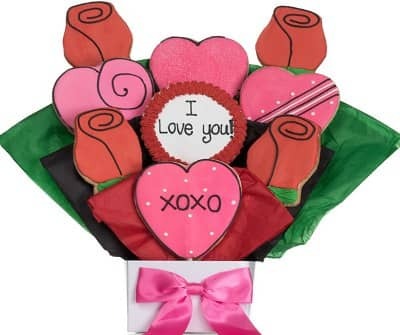 This popular assortment is a great gift for Valentines Day or I Love You moment and features brilliantly hand decorated Hearts and a Cookie Plaque that conveys the perfect message!